"Imagine a game with a narrative influenced by real-time events"
The Switch's meteoric rise has resulted in a flood of support from small-scale indie developers, some of which have swiftly ported over smartphone games which benefit from enhanced features on Nintendo's console. While a great many of these games are well worth your time, a few have been quite lazy - leading some players to dismiss such efforts with scorn. 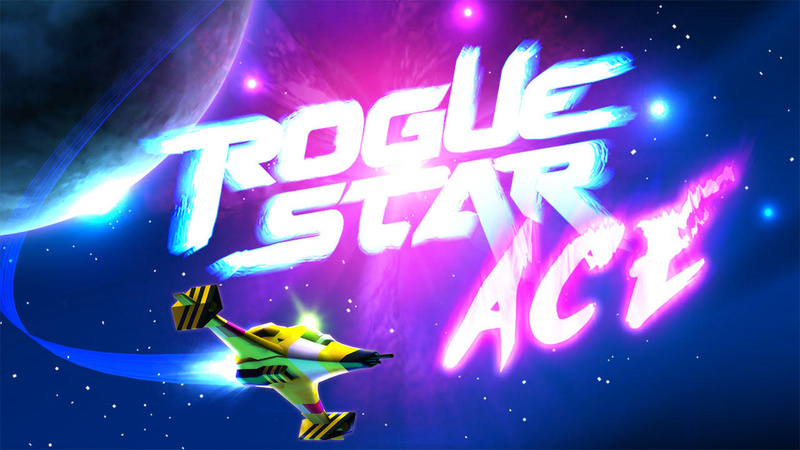 Those same individuals may be tempted to disregard RedBreast Studio's upcoming Rogue Star ACE; previously available on the iOS App Store - where it was blessed with the Editor's Choice accolade - it's now bound for Switch, but creator James Duncan wants to make it perfectly clear that this is no simple mobile port; it's a sequel built exclusively for Nintendo's hybrid system. Keen to know more about the game and its forthcoming Kickstarter campaign, we sat down with Duncan for a quick chat. Nintendo Life: Can you give us a little background on your career and what other games you've worked on in the past? James Duncan: I've been involved in the art side of the games industry for quite a while. My first finished title was Die Hard Trilogy, way back on the PlayStation. I created a lot of its 3D world and models. After some years at Sony, via a film degree, I ended up at Lionhead creating art assets on Fable 2 and 3. What led you to establish you own indie studio and what challenges does it bring when compared to working for a larger company? I started because around 2010 the environment suddenly existed for truly independent development. This became possible really through a combination of mass digital distribution and the availability of genuinely viable 3D engines. Challenges, where to start! I think it mostly boils down to though a general lack of resources. However that can be an asset occasionally as these type of restrictions regularly force you to be very creative! This can be fulfilling and frustrating in equal measure! 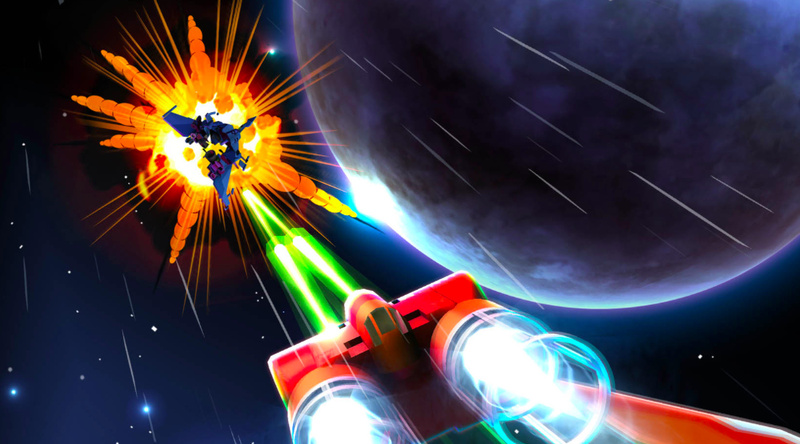 We're getting a Wing Commander / X-Wing vibe from Rogue Star - is it fair to say that those games inspired you? The trading aspect also brings up comparisons with Elite - was that an influence as well? Absolutely, I hold Tie Fighter in the highest esteem possible, a hair’s breadth beneath Elite in fact - which is my all-time favourite game. I’ve found inspiration in other great titles like Red Baron, Secret Weapons of the Luftwaffe and Independence War. When I was a kid I loved collecting and reading old second-hand '60s and '70s science fiction novels and storytelling in general. I also had a passion for flight in all its forms; planes, helicopters, rockets - so when Elite came along and combined my two loves, I was well and truly hooked. It was this specific combination of imaginative sci-fi and old fashioned dog fighting which I found irresistible. What makes Rogue Star unique when compared to other games of this type? I think more than anything its the approach, which was born of a passion for a time when games were very much designed to provoke a player’s imagination and provide a fun challenge. Games from that era relied on skill-based mechanics to offer a real sense of progression, achievement and wonder. I also feel that the title has a distinct personality and character, with a healthy dose of humour along the way. What aspect of the game are you most proud of? That I didn’t dumb it down. There was a lot of advice during development to tone down the control mechanic with auto lock-ons, "auto this, auto that" to make it more approachable for mobile gamers. However, I was clear that I wanted to stick to my original intention of creating a game that I wanted to play and that meant a mechanical depth which provided nuance and challenge. In the end, this approach led to the sequel - Rogue Star ACE - being relatively pain free so far to bring to the console space, where players expect a certain amount of depth and features. What improvements will you be including in the Switch version of the game? Well, the Switch version is a sequel, so there will be substantial differences! Enhanced graphics, 3D cockpits, different cameras, orbital platforms, more ships, enhanced trading and multiplayer dogfighting, to name a few. The highlight however, will be a totally unique story driven mechanic which I'm dubbing 'Space Master'. I will be announcing more about this in time for the Kickstarter, but essentially, certain player exploits will be continually monitored and the story will change based on those exploits. Imagine a game with a narrative influenced by real-time events but controlled by a Space (Dungeon) Master. It’s going to be very cool. How easy has it been to work with the Switch? Was it easy to port the game over? The actual process is relatively straight forward currently because of the use of robust 3D engines, in ACE’s case, Unity. The actual ‘port’ itself will start if the Kickstarter succeeds. Everything up to this point has been designed within the engine using the Switch as the target. These engines reward thoughtful planning and economical solutions, which I find very much a throwback to an older style of development. In those days you had to work within constraints and be creative to wring every last ounce out of hardware. How much contact have you had with Nintendo so far? Have they been supportive of your work, when compared to Apple or Google? Speaking as an indie, building a relationship with publisher and platform holders is always one of the most challenging aspects of development. Not having the clout of a big company behind you means you have to fight for every inch. Contact with Nintendo has been good. It was tough initially to get their attention but it was understandable, given the launch of a new console. What do you make of Switch as a gaming platform in general? Could you see yourself making a game exclusively for it? Well, at the present time of speaking ACE will be an exclusive Switch title. I’ve always been extremely enthusiastic about Nintendo’s consoles. A little known fact is that Rogue Star was originally designed for the DS! What I’ve always loved about Nintendo is the passion and knowledge of its user base. That’s what really draws me to their consoles as a developer. The Switch’s feature set is extremely flexible and offers much for developers to explore their creativity. I do miss StreetPass though! What's next for you, project-wise? At the moment getting the opportunity to finish ACE is the only thing that I’m thinking about! Moving forward though, ideally I’d like to support the title further and build on the franchise and Space Master feature. The game takes place in Rogue System, which is effectively a penal colony, just a very big one. There’s a whole galaxy out there I’d like to tell the story of though. Imagine all the cool stuff that goes on outside in free space! We'd like to thank James for his time. 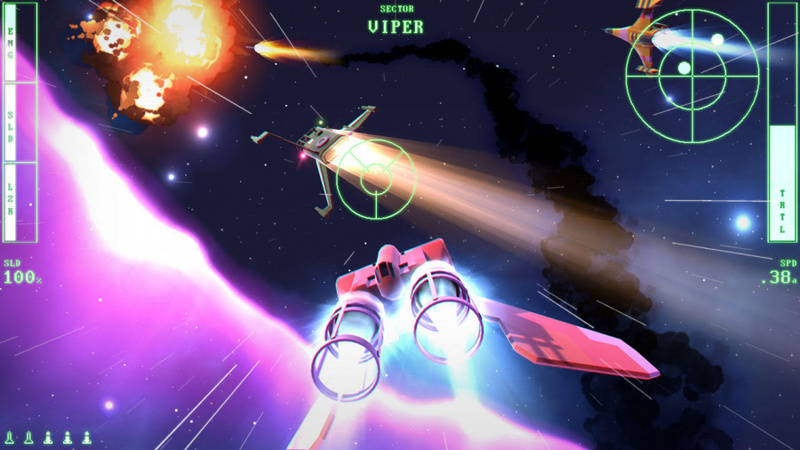 You can keep up to date on Rogue Star ACE by visiting the game's official website. Loves me a good space game. If it's anything like Elite I'll be buying it. The video I watched above reminded me of Frontier Elite 2 on the Amiga. I played this on iOS and unlocked all the ships, planets, so it did get its hooks into me. I enjoyed it as far as it goes, particularly the combat and trading auction mini-game, but it could definitely use additional features in its Switch iteration. Still, it sounds like that's exactly what's planned, so with that proviso I'll be really looking forward to this. Excellent, something fresh to look forward. It's about time the Switch get's some decent chunk of space shooting/exploration games. We need more space games! He said 3D cockpits so I assume that means first person view. I prefer that view as it's more immersive to me. The big deal breaker for me is, is this game on rails or free roaming? Do I play as Gene Starwind? This looks awesome! There need to be more of this game genre on the game market. Hey everyone. I'm the developer behind Rogue Star ACE. Just thought I pop on here to introduce myself. If you have any questions, You can post them on the official site or fire away here. Happy to answer and discuss aspects of the game or just space games in general! @NGW - The original game is available on iOS. ACE however, is a ground up Switch exclusive sequel. Ah I see, must have missed that bit. My mistake. Is this game a Kickstarter? Looks great by the way, will definitely be purchasing. @mattmayatt -Yes it will need KS to push it through. The campaign will launch as soon as I feel confident I have a chance of succeeding. Crowdfunding is extremely difficult for a small indie to get visibility and run successfully. Gamers are (rightly) cautious about kickstarters now, so when I do launch the campaign, I need to ensure that I can prove to players why I think ACE deserves their consideration. Stay tuned to the website and hopefully I'll have lots of cool stuff to show everyone. Even better, comment and tell me your opinions! I really want players to feel like their opinions count because they absolutely do. @Captain_Jim Project looks really awesome Captain Jim! When the Kickstarter is launched, how much time do you feel will be needed till the game's launch? Thanks @wyzworld76 I really appreciate your praise! Currently I'm targeting 9 months from the end of the campaign. That might seem a long way away but in development terms it is very aggressive indeed. In fact, I still might add a month or two onto it, just to be ultra cautious. I've been through the development cycle many times though, which I hope will give players confidence in my words. Financial backing from KS will be crucial. The target amount needs to be achievable in the current kickstarter climate, but also one which is ruthlessly realistic. It's a difficult balancing act! As long as I can get modest financial backing though, I'm very confident I can deliver a space game unlike any other. @Captain_Jim Hello! Your game sound fantastic. May I ask, what kind of content do you plan to include that would affect the ESRB rating? As in, is the game, so to say, "clean?" I take this into careful consideration before buying a game, as I only play games that are relatively clean content wise. Your concept sounds brilliant, and a player-influenced story like yours is what I legitimately dream of, so I'm hoping it's clean. I know that's a big thing to ask, but I love the idea and hope it's something I would be comfortable investing myself in. @Captain_Jim Congrats on your new Switch foray! I look forward to supporting you on KS The most important thing is gameplay, it must be fun! Atmosphere is important too. Also, I’m fine with the game being dirty All the best! @Audiobrainiac well he did mention dogfighting so it may just be something like Star Wars: Rogue Squadron II: Rogue Leader on GameCube. I use that as an example because that's the most recent space combat game that I've played. Thats a great classic. I guess I'm more into simulation-type stuff, like Colony Wars or something. I dismiss phone game ports with scorn because with 90% of them, that is all they deserve. Phone games are the bottom of the barrel trash that are only even a thing because most people already have a phone. @Heavyarms55 Perhaps you should actually READ the article before bashing this as a "phone game port." The original game was designed with the Nintendo DS in mind but ended up being reworked and released on iOS. This game is a SEQUEL and designed from the ground up to be a Switch exclusive. @Racthet916 Perhaps you should read my comment before replying: I never said THIS game was a phone game port, I was commenting on the idea of those, since this article brought it up and it is related. And I stand by my opinion that phone games are bottom barrel trash. I just really hate space-ralated games. @DarthXenos - Pricing is yet to be determined. It's an ongoing task to arrive at the right price for both players and cover development costs. What I can say however is that I'm not a fan of the very high price bands of some eshop titles. So expect the pricing to be reasonable and fair. Regarding discounts, I’m not aware of any reason why some campaigns offer discounts only. I see no reason why I won't be offering full copies. AFAIK, game codes can simply be ordered from Nintendo. In case people are wondering about a physical release, that is entirely down to Nintendo. Although, there is nothing more I’d like than to see it get one! Incidentally, I can say that one of the KS tiers will include a physical game box in the style of old Amiga titles. I’m a huge fan of physical boxes and manuals. Hi @MH4 - I'm glad you like the sound of ACE. Tonally, Rogue Star's world is quite light hearted. This will change slightly in ACE, as some of the bigger themes reveal themselves. However, it's not a world which relies on dark themes nor swearing. For instance, 'frak' is one of the common swear word substitutes used by humans and aliens. I want to provide a deep world for the player narratively, fire their imaginations and move away from vast but sparse game worlds. @gdog Thanks! Knowing players are interested in the title means a lot! I 100% agree that fun is the most important feature and I'm entirely focused on delivering on that front. @Audiobrainiac - ACE will be free roaming. I much prefer the freedom of those mechanics. I'd hesitate to use the word simulation, as it can be off-putting to some and suggest overly complicated controls. And ACE definitely isn't that. However, ACE certainly leans towards a more involved flight mechanic, requiring pilots to really earn their kills in combat. I always aim to create game mechanics that are easy to grasp but hard to master and ACE will follow that ethos. Btw, I love Colony Wars too! @Captain_Jim indeed Also, I commented before reading the article - so you worked on Die Hard Trilogy! I loved that game! I had it on Saturn, the atmosphere & the music was, & still is, great I miss light gun games...Anyways, looking forward to Rogue Star Ace!! @gdog Die Hard is fondly remembered by a lot of players. I count myself very lucky to have played a part in its development. It definitely taught me the importance of placing fun above all else. @KIRO - Absolutely, I'm very aware of the scepticism which exists now for crowdfunding. And it's unfortunate that some campaigns have created that uncertainty. Under promising however, can also bring with it its own problems. There does need to be a certain amount of ambition and interesting features to enthuse players and make them feel that this is a project they can get behind. The problem is when project's over promise and mismanage. On this count, it's my aim to do everything I can to earn potential backers' trust. And I hope to illustrate that via an ultra realistic mindset. @Captain_Jim I certainly don’t mean to box your game in. I can be picky about everything, sry. It does sound right up my alley however, your answer has peaked my interest and I appreciate u logging in personally to inform us. Thanks Cap’m! @Captain_Jim Thanks for the response. Maybe “under promising” was the incorrect expression. Transparency and hoenesty are the keys as you say. Absolutely ambition and creating an enticing narrative is crucial too. Will enjoy watching the project unfold! @Heavyarms55 Fair enough, I interpreted your comment as though you hadn't read the entire article. Fact of the matter is, I actually agree with you about mobile ports, which this appears not to be.